We have an intimate relationship with our medicines. Some of us share our beds with the blue Vicks bottle. Many folks I know spend their quality time in the loo with a tube of Volini. The women of the house in several cities wear a perfume called Amrutanjan. Crocin is the 3 am friend that a lot of families turn to when a crisis strikes. Despite being such thick pals, we know very little about these guys. Let me lift the veil once and for all to reveal a few nuggets about them. Medicine 101. The sore throat reliever, Strepsils has been around since 1958. Those with a secret crush on Doordarshan will remember how the lozenges have the power to turn even a meow into a roar. But have you ever wondered why ita��s called Strepsils? The name is derived from Streptococcus (the bacteria that causes throat infections) and Pastille (the word for a flavoured tablet). I bet you didna��t know that! Another story you may not be aware of involves a Burmese gentleman named Aw Chu Kin. On his deathbed in the 1870s, hea��s said to have asked his two sons Aw Boon Haw and Aw Boon Par to improve his herbal formulation, which provided external pain relief. The product was apparently named after Aw Boon Haw, which translates to a�?Gentle Tigera��. Today, we know the brand as Tiger Balm. One more surprising fact: Eno, the antacid, was invented in the 1850s by James Crossley Eno. Hence the catchy and relieving name. And Vicks owes its moniker to Dr Joshua Vicks, the brother-in-law of Lunsford Richardson, the genius behind the Vicks Vaporub. 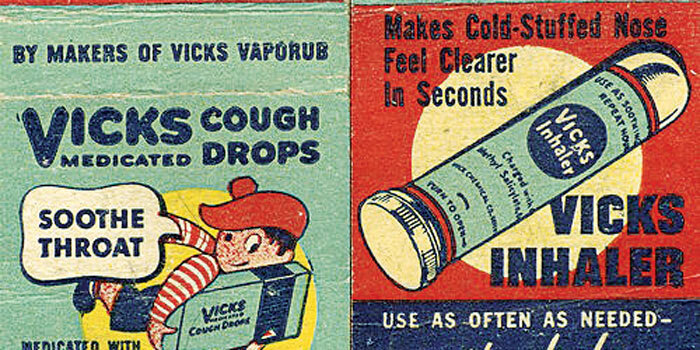 Richardshon chose Vicks as it fit neatly into the packaging label on the now famous bottle. Incidentally, Vicks was dropped in Germany as the Germans pronounced it as Ficks, which happens to be an embarrassing four-letter word. To save the blushes, Vicks assumed the avatar of Wick over there. More often than not, active ingredients have a major say in medication naming. Headache cure Anacin is a conflation of Analgesic and Caffeine. Botox is a derivation from Botulism Toxin. And Iodex is but an ointment made from Iodine Extract. Now that you know more about your pain killers, you will hopefully raise a toast in their honour.